Alan Tonkin isChairman of the Global Values Network Group whose web site was one of the most advanced in the world at using Spiral Dynamics to monitor shifts in societies and assess impacts at both national, international and even global levels. As we enter 2008 with all its challenges and opportunities it is appropriate to consider the global situation and in particular the developed world’s obsession with the spreading of Western style constitutional Democracy on a global scale. In considering the above statement, it is important to note that, in the case of Europe and the USA, this process has been a long journey over centuries, going back to the Middle Ages. What is now being demanded of many developing countries is that they move rapidly in values terms from tribal societies as in the case of Iraq, Afghanistan and Pakistan to constitutional democracies overnight in historical terms. In Iraq and Afghanistan the military are now encouraging ‘local militias’ to protect their own areas. This has proved to be a successful tactic; but, with the withdrawal of the military, will these same militias become major barriers to securing the role of the central government in the future as an overall strategy? In South Africa, following the recent ANC Conference held recently, the clear split between Thabo Mbeki and Jacob Zuma clearly came down to values differences. President Mbeki largely supports a strong economic and monetary policy and is seen as an ‘economic intellectual’ largely divorced from the people, while Zuma is a ‘man of the people’ who is supported by the rural and urban masses and trades unions. In order to more fully understand our ‘Global Village’, it is important to realise that different societies are at different places in terms of development. This not only applies to economic development which is self evident but also ‘values development’ which is in all probability more important and more difficult to see and understand. What is clear from the above is that many people “talk the talk” of Democracy but, due to where they are on the values curve, they are unable to “walk the walk”. As long as the developed democracies fail to grasp why this is so, they will continue to fail to influence long term meaningful change in the developing world. Certain sectors of the international press are however, starting to realise that economic development and Democracy go hand in hand. However, it is the type of democracy that is employed that is critical, as being in the wrong gear on the development and values curve can lead to economic and political disaster. A good example is China where development with a certain amount of freedom is tolerated. This is similar to the early years in Singapore under Lee Kwan Yu who developed the Singapore economy while holding back on other freedoms. The influence being exerted by Vladimir Putin on Russia is also another example of this. In considering the graphic below it is clear on the bottom axis the progress made in Europe over the last 300 years. 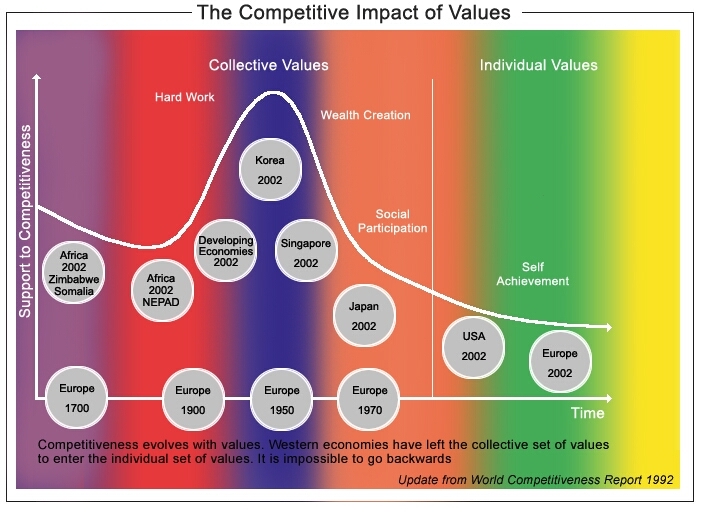 Equally, the current situation very clearly shows the wide spread of values exhibited across the globe in the top curve. The global move from ‘Collective’ to ‘Individual Values’ is a critical part of the development of a Western style democracy which is impossible under a collective values set. In order to better illustrate this, I will use the graphic developed by Don Beck showing the different stages of values, democracy and economic systems. 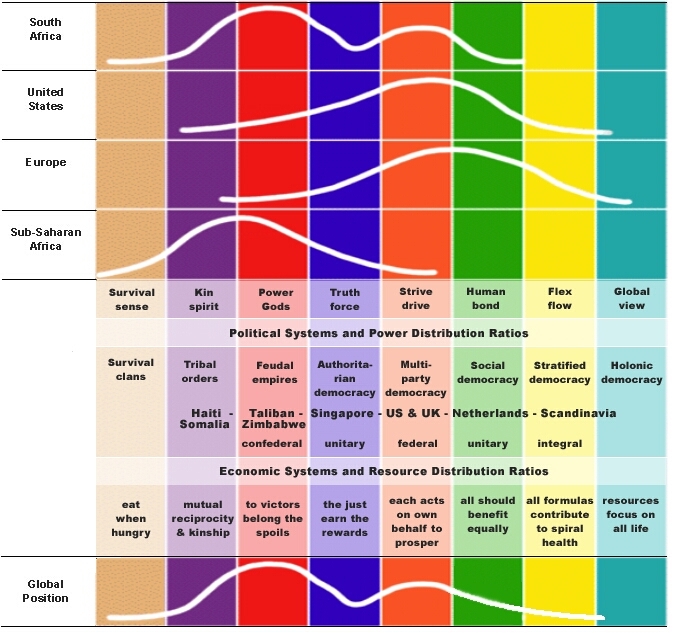 The global position very clearly shows two peaks with the first being the developing countries centred in the Tribal PURPLE/Power RED/Blue ORDER areas. The second peak is the one formed by the developed population around the world in the BLUE Order/ORANGE Enterprise/GREEN Environmental sectors. At this stage the UN is dominated numerically by the former section with over 50% in this area but the future focus of the organisation needs to be on the second developed sector. The leaders and governments of the ‘developed world’ need to learn and better understand what is required for the developing countries to move forward and progress. How often does one hear the view from the developing world that the ‘developed nations’ do not really understand the issues we face on a daily basis (with our multi-values population mix). Clear ‘guidelines’ need to be implemented regarding the granting of global aid and how this money is being used. Accountability is the key here as, without this, the ‘funding’ is not utilised correctly. This equally applies to the ‘Aid Industry’ or NGO’s. Without open and transparent accountability from recipient nations, funding needs to be restricted. This is particularly difficult when China is seeking new markets as well as raw materials. However, this needs to be vigorously pursued by the developed nations if real movement is to be achieved. Developing nations who wish to follow a path of rapid economic growth should be encouraged to do so by the use of incentives and the opening up of markets to their goods at very preferential rates. A ‘Marshall Plan’ type approach should be used using a ‘global development fund’. Technology transfer is also a particularly effective way of ensuring that developing nations are able to ‘leapfrog’ outdated technologies and move on immediately to cost effective ways of moving their economies forward. Broad education reform at all levels should be a global priority with technology, including the internet, being widely used to bring global experts with the ‘appropriate values’ into communities and their places of learning. There are other areas that need to be addressed; but the above provide some do-able solutions to a number of key global issues. Equally, using values as the template for global action provides a model for other related actions in other areas.